A female photographer and a male doctor have just crash-landed in the vast, unforgiving High Uintas Wilderness range. There’s no sign of civilization as far as the eye can see. Rescue is not on the way. The winter conditions are treacherous. There are only three possibilities: 1. They both die on the spot. 2. One dies and the other lives by eating the other’s remains, Alive-style. 3. They fall in love while searching for help. 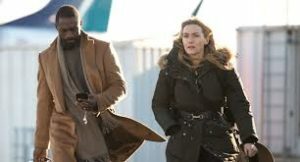 Now consider that The Mountain Between Us stars the alluring Kate Winslet and Idris Elba, and it’s billed on Wikipedia as a “romance-disaster film.” Guess the answer! Now take a deep breath of oxygen. 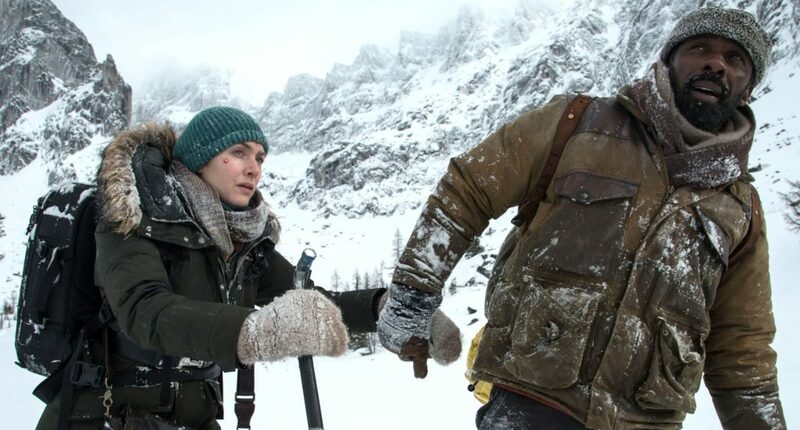 Sure, The Mountain Between Us is a shamelessly hokey and absurd epic desperate to be the 2017 incarnation of The English Patient, minus the pesky war. In fact, a week before I went to the premiere at the Toronto International Film Festival, an industry source whispered to me that the film “was not good.” But guess what? I devoured it. It’s an enthralling entry in the fall movie season. And the alluring Winslet and Elba generate enough heat to thaw out even the worst case of frostbite. Now it is possible that the story, adapted from the 2011 novel of the same name, was crafted several thousand feet above sea level. Alex (Winslet), a reckless photojournalist, needs to go from west to New York City because she’s set to get married the very next day. Girlfriend is cutting it waaaaay too close. Meanwhile, Ben (Elba), a married British surgeon must land in New Jersey immediately because he’s performing surgery on a 10-year-old boy. They’re both grounded due to bad storm. Alex meets Ben in the airport and corrals him into chartering a flight to Denver. For unknown reasons, he agrees. Neither of these smarties know how to read a weather radar or use an airline app to rebook their flights. Their tiny private plane goes down in a hurry. It’s a harrowing sequence, one that jangles your nerves and makes you want brace for impact in your seat. The few minutes that come before it set up the inevitable disaster. Beau Bridges plays the good-natured, aging pilot who doesn’t seem even at all worried about the weather and promises a safe journey (uh-oh!). Winslet gets out of her seatbelt to make small talk and pet Bridges’ dog (double uh-oh!). The unintentional humor provides a welcome tension release pre-crash. Alex has a broken leg. Ben is battered and bruised. Bridges is a non-factor. The dog is fine, yay! But Director Hany Abu-Assad (Paradise Now, The Idol) makes his narrative priorities clear from the outset: Romance first, safety second. It’s not always the smoothest terrain to navigate. Ben may fall off a cliff, but wait a second, why is he hiding marital secrets?! Alex may get attacked by a mountain lion in the fuselage, but what’s up with her fiancé? Their bickering over strategy doubles flirty banter. Alex wants to hobble her way to safety — she has a whole world waiting for her back home. But Ben, who has impromptu survival skills that would make MacGyver jealous, prefers to play it safe and wait. But he’s also a British gentleman and it’s in his nature to care for people, swoon. When they find a desolate cabin, it’s only a matter of minutes before they put that warm bed to use. 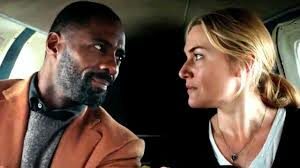 It’s a testament to the magnetic Winslet and Elba, on screen together for about 95 percent of the movie, that they’re able to pull off this love-on-the-rocks relationship. Their characters share a natural chemistry as well as a dark sense of humor. (Alex begs Ben to use up battery on his dying smartphone to play a morsel of music.) Imagine Tom Hanks in Cast Away, except his beloved Wilson is played by a buxom, warm-blooded woman. Will they live or die? I won’t give it away, only to say that somebody has to take care of the incredible dog. And remember: Twenty years ago, Winslet played another headstrong character that falls hard for a stranger amid a transportation disaster. It could be a coincidence . . . or further proof that the actress can wring out meaningful romance under the most extreme circumstances. The Mountain Between Us is no Titanic but it is a wholly riveting two-hour diversion. Is it wrong to conclude this is the ideal movie to watch on an airplane?